This is a foreign exchange guide to Turkey, the Turkish Lira currency plus TRY transfers and travel tips. Turkish Lira exchange rates - latest & historic exchange rates. What is the Turkish Lira currency code and symbol? The three letter currency code for the Turkish Lira is TRY and the symbol is ₺. Which countries use the Turkish Lira? It is the domestic currency in Turkey. The lira is subdivided into 100 kuruş. Global interest in the lira has picked up considerably since the turn of the millennium. By 2016, the lira was the 16th most traded currency in the world. It had been 30th most traded in 2001. Precious metals remain an important cog in Turkey’s economy. “Turkey is home to the entire gold value chain from mining and refining, to jewellery design and investment,” says the World Gold Council, and this therefore links short and medium-term changes in the lira’s value to the broader commodities cycle. Short-term changes in the lira are also driven by risk sentiment. As a riskier, emerging market currency, the lira will fall in value against the major currencies of the world (especially JPY, USD, CHF, GBP and EUR) during periods of economic uncertainty or when geopolitical risk is elevated. It is fair to say about the lira’s long-term value that it is stuck in perpetual decline. Ravaged by above-100% inflation, the lira lost 97% of its value against the dollar between the mid-1990s and early 2000s. In 2003, with a single dollar buying 1.5 million lira, the Turkish government decided to redenominate, and this took place in January 2005, striking six zeros from the lira. Post-redenomination, the historic downtrend in the lira persists, barring some stability between 2005 and 2008. Between January 2008 and January 2017, the lira lost 71% of its updated value as TRY/USD fell from its post-redenomination high of 0.8772 (USD/TRY 1.14) to its post-redenomination low of 0.2538 (USD/TRY 3.94). 12-March-2019: Turkey’s lira suffered its worst one-day fall since the country’s crisis last year, amid a global retreat by investors from riskier assets. The lira fell over 5 per cent against the dollar to as low as TL5.82, breaking a period of relative calm in Turkish financial markets so far this year amid rising caution over the resilience of the global economy. Though the lira is considerably stronger than its August ’18 extreme, it is still worth nearly 30 percent less than it was a year ago. In mid-2018, the lira weakened beyond 7 to the dollar (a record low), shocking investors. With the US Federal Reserve now likely to slow the pace of its interest rate hikes, or stop them, the dollar is forecast to weaken, and emerging market currencies typically gain value in such conditions because their respective governments usually hold high levels of dollar-denominated debt, which becomes easier to repay when dollars are cheaper. The interactive chart below shows the USD to TRY exchange rate for the previous 3 months with rate alerts for days when the exchange rate moved up or down significantly or for 30 day highs and lows. From the ancient port city of Ephesus (Efes) to the soaring Byzantine dome of Aya Sofya, Turkey has more than its fair share of world-famous ruins and monuments. A succession of historical figures and empires – including the Romans, Byzantines and Ottomans – have all left their mark on this former stopover along the Silk Road. Experiencing their legacy takes you from the closeted quarters of the sultan and his harem in İstanbul's sprawling Topkapı Palace to the romantic and mysterious Lycian ruins on Mediterranean beaches. What currency to use in Turkey? In Turkey cash machines that dispense Lira are everywhere, usually with around a 2% conversion, and probably a $5 transaction fee from your bank per transaction. The Euro is accepted in some places, and the American dollar almost nowhere. Turkey businesses have a bit of a 'get a little more if you can' attitude so check your bills and if you would prefer not using your credit card perhaps purchase a Prepaid Travel Card before leaving. The Turkish haggle so if you are a stern haggler you can get items up %40 of the price initially quoted. Your home-bank account will be debited for the amount you withdraw from a Turkish ATM (plus a service charge, of course). Because bank card fraud is a big problem in Turkey, there is a chance that your home bank may limit or deny use of your ATM/cash/debit card in Turkey so let your bank know in advanced you are going there. 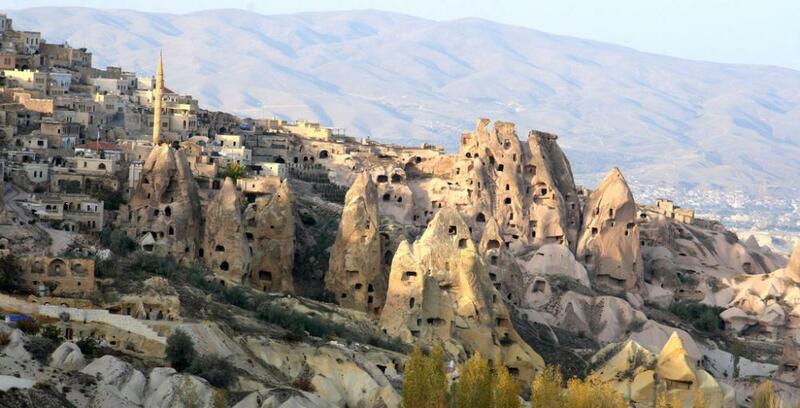 Cappadocia's otherworldly 'fairy chimney' rock formations. How to get around in Turkey? Turkey is well connected by air throughout the country, although many flights go via the hubs of İstanbul or Ankara. Domestic flights are a good option in such a large country, and competition between the following keeps tickets affordable. Turkey's intercity bus system is as good as any you'll find, with modern, comfortable coaches crossing the country at all hours and for very reasonable prices. On the journey, you'll be treated to hot drinks and snacks, plus liberal sprinklings of the Turks' beloved kolonya (lemon cologne). Public buses are a good and economical way to travel between cities in Turkey, but they are not as comfortable as intercity trains in Europe. The buses are generally 20-30 passengers and serve both as regional transportation and city buses which means people get on and off, paying for driver for the distance they travel. You can purchase a guaranteed seat, but when you board you may find it full. Just get the driver to ensure you get a seat. Bus fares are subject to fierce competition between companies, and bargains such as student discounts may be offered. Prices reflect what the market will bear, so the fare from a big city to a village is likely to be different to the fare in the opposite direction. Unmarried men and women are not supposed to sit together, but the bus companies rarely enforce this in the case of foreigners. You may be asked if you are married, without having to produce any proof of your wedlock, or both travellers may find their tickets marked with bay (man). Most Turkish cities and towns have a bus station, called the otogar, garaj or terminal, generally located on the outskirts. Besides intercity buses, otogars often handle dolmuşes (minibuses that follow prescribed routes) to outlying districts or villages. Most have an emanetçi (left luggage) room, which you can use for a nominal fee. Don't believe taxi drivers at otogars who tell you there is no bus or dolmuş to your destination; they may be trying to trick you into taking their taxi. Check with the bus and dolmuş operators. Because most bus stations are some distance from the town or city centre, the bus companies often provide free servis (shuttle buses). These take you to the bus company's office or another central location, possibly with stops en route to drop off other passengers. Ask 'Servis var mı?' ('Is there a servis?'). Rare cities without such a service include Ankara and Konya. Driving around Turkey gives you unparalleled freedom to explore the marvellous countryside and coastline, and to follow back roads to hidden villages and obscure ruins. Bear in mind that Turkey is a huge country and covering long distances by car will eat up your time and money. Consider planes, trains and buses for long journeys, and cars for localised travel. Public transport is a much easier and less stressful way of getting around the traffic-clogged cities. Turkey has many ancient ruins. Turkey's diverse landscapes, from Aegean olive groves to eastern steppe, provide a lyrical setting for its many great ruins. The country's most magical scenery is to be found in Asian Anatolia, where beautiful vistas are provided by the vertiginous Mediterranean coastline, Cappadocia's otherworldly 'fairy chimney' rock formations and wavy valleys, the alpine pastures of the Kaçkar Mountains, and golden beaches such as 18km-long Patara. In the touristy areas and you look like a tourist you will be flocked by people trying to sell you all manner of things. If you do not want anything they offer it is fine to ignore them, they will eventually move onto the next tourist. Drink bottled water, its cold and cheap and since it can be hot all the time in Turkey have some on you at all times to avoid dehydration. The best thing about sampling Turkey's delicious specialties – ranging from meze on a Mediterranean harbour to a pension breakfast featuring ingredients fresh from the kitchen garden – is that they take you to the heart of Turkish culture. For the sociable and family-orientated Turks, gathering together and eating well is a time-honoured ritual. So get stuck into olive oil–lathered Aegean vegetables, spicy Anatolian kebaps and dishes from Turkey's many other corners – and as you drink a tulip-shaped glass of çay and contemplate some baklava for dessert, remember that eating is deepening your understanding of Turkey. Save money and time by Ordering your Turkish Lira online from Travelex, you get better rates and can pick up the TRY cash locally or even on travel day at the airport. For card purchases if offered a choice of currencies always select to Pay in Turkish Lira otherwise you may get much worst exchange rates. Compare TRY travel cash rates - probably why you are here! When searching around for information on how to get a good exchange rate when sending money to Turkey you need to start with finding out the latest Turkish Lira foreign-transfer exchange rate. What prime property does $US1m buy in Istanbul? The area (㎡) of prime property that $US1million buys in Turkey's capital city Istanbul in Q1 2018 is 110㎡. This is compared to equivalent areas for Hong Kong 22㎡, London 27㎡, Singapore 37㎡, Paris 45㎡, Shanghai 50㎡, Tokyo 70㎡, Berlin 74㎡, Mumbai 94㎡, Dubai 138㎡ and San Paulo 172㎡. Once your funds are received by the provider the converted TRY amount will be transfered to the recipient account you specify in Turkey. Use our Send to TRY calculator to compare the exchange rates of FX specialist providers rates versus your bank's standard rates you can hopefully save around 5% and maybe more - end result is more Turkish Lira deposited into the recipient bank account and less margins and fees kept by the banks!